Every recipe in this book has been both authentic, and full of detailed instructions. A very reliable book for French country cuisine. It's full of information about the different regions of France and traditions. A beautiful book. Ultra simple and classic. Uses cream but you can still taste the peppery/acidic note of the watercress. Simple & tasty garlic tomato soup. I was not a fan. This was bland and the ratio of tomatoes to onions was off. Wonderful soup elevated by the addition of foie gras! This is good and not difficult. I've had it as a starter in Burgundy, but it is a bit much for that; here in California, I used it for a light supper. It is not a pretty dish, but look at the components -- how could it not be good? Simple. Made in the oven without bain marie but still need to find the optimal cooking temp for that modification. Made again; skipped the bain marie and used a low temperature oven (started at 220F, finished at 230F). They were a little overdone. Classic quiche lorraine with precise instructions. Very nice roasted fish with herb butter. I made this recipe with cod since monkfish is endangered. This is excellent. My turbot broke apart (when I used tongs to move it from the dutch oven after poaching), making the recipe like a creamy fish stew. I used a Granny Smith apple, which remained firm. Love this recipe. So easy and delicious. Just colour the shrimp, finish with salt and a good amount of pepper, or pimenton, or espalette, or sumac. First recipe in Anne Willan' wonderful book that was a slight disappointment. It was not bad, just a little bland. After a while I enjoyed its subtle flavor but my husband just thought it lacked flavor. Otherwise it's a simple recipe that requires few ingredients. I wanted to like this a lot more than I actually did. I'm not convinced the marinating actually did anything. There was too much sauce after cooking and it was too thin. The garnishes were a bit bland. I like the version from Mastering the Art of French Cooking much better. It's a little fussier than my standard BB recipe, but the results are outstanding. Sauce is the business. A good sub for veal chops is braised rabbit. Good, flavorful roast lamb with white beans & tomatoes side dish. Recipe is somewhat similar to the one from Les Halles. The meat to fat ratio is about the same (1.7 to 1 versus 2 to 1 in Les Halles), but she uses escalopes in addition to the pork shoulder. Chicken livers are used instead of pig livers, and only a small amount (that would be 0.33 compared to the amount of fat needed in the recipe). Chicken livers are easier to find and their taste is less pronounced than pork, so the change was welcome for me. I used a grinder with a coarse die. I lined my mold with plastic wrap so I would not have to hunt for caul fat . Everything worked well and I was pleased with the end result. I would make the recipe again and maybe add some pistachios next time, and also some cream for spreadability (10% of the amount of forced meat). This recipe is a little less intense and heavy than some of the other traditional recipes. I omitted the canned tuna. I like the inclusion of almonds and bread. It is great as a dip. This is a gorgeous, delicious, and rich potato gratin. It takes awhile to make but it's worth it. This potato gratin is more about the cream than it is about the cheese. Potatoes, bacon, cheese. What else can I say... Perfection. These are the traditional galettes (savory crepes) from Brittany. My favorite filling is egg, ham, and cheese (gruyere). They are delicious. I just cook a pile of them, keep them warm, and then reheat them with good quality butter and add the various fillings at the last minute. I had high hopes for this recipe. It ticks all the boxes with ingredients I love, but sadly it fell flat. The marinade is very one-dimensional and that is because the coriander seeds overwhelm everything and the bright lemon flavor fades fast. Oh well, you win some and you lose some. I'll keep trying to find that elusive marinated mushroom recipe that tastes as good as the ones from the olive bar at the grocery store. This is a classic French salad. The bitterness of the frisee is a nice counterpoint to the richness of the bacon. Excellent classic ratatouille. Mine took longer to fully cook than the instructions. 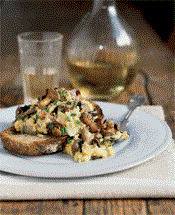 Makes excellent leftover that can be served with eggs. A simple and serviceable roasted squash recipe. My squash came out perfectly roasted, and the herbs (a ton of rosemary, thyme, and bay leaves) were not too strong. Good classic baba au rhum recipe. I used popover molds and they were way too big. I forgot to take into account that the babas almost double in size when they soak up the rum syrup. Simple and excellent. Use the best better you can find for this recipe. A good recipe to make if you have leftover egg whites. This is the traditional "galette des rois". It's great and best eaten still warm. I made a triple batch. The batter was a little bit thick so I added some milk. The yield for the triple batch was 24 large crepes (based on the recipe I was expecting at last 30). The recipe is a little involved but I like the result better than my normal recipe. The texture and rise were really good. Make sure to use high quality butter and honey. I did not care for this cookies. They're rather dry. They don't have a lot of flavor. And the instructions in the recipe are poor. The flavor is great with sour cherries and kirsch, but it suffered from weeping, so I probably won't be repeating this version. The quiche is good but was a little "wet" even though I had baked the crust separately. I used a mix of red onions and baby green onions as I was out of yellow onions. I used foie gras fat instead of goose :-) and I substituted blue d'auvergne for the roquefort. The sauce is flavorful with just a hint of the mussels. This is pretty quick to make. I really liked the sauce for the chicken and the recipe makes plenty of it. The chicken itself was a bit dry after too long of a cooking. I have a similar recipe that uses a whole chicken that I like better. My gratin was a little soupy (too much sauce for the amount of chard that I had) and I had to skip the mushrooms since I did not have any. I added some homemade ricotta with the gruyere. The flavor was very good. 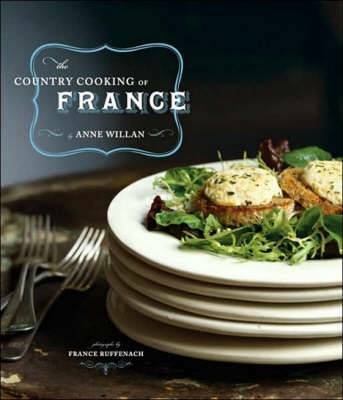 Renowned for her cooking school in France and her many best-selling cookbooks, Anne Willan combines years of hands-on experience with extensive research to create a brand new classic. More than 250 recipes range from the time-honored La Truffade, with its crispy potatoes and melted cheese, to the Languedoc specialty Cassoulet de Toulouse, a bean casserole of duck confit, sausage, and lamb. And the desserts! Crêpes au Caramel et Beurre Salé (crêpes with a luscious caramel filling) and Galette Landaise (a rustic apple tart) are magnifique. Sprinkled with intriguing historical tidbits and filled with more than 270 enchanting photos of food markets, villages, harbors, fields, and country kitchens, this cookbook is an irresistible celebration of French culinary culture. Anne Willan is an award-winning cooking teacher, food writer, and the author of more than 30 cookbooks. She operates La Varenne, her esteemed cooking school, at Chateau du Fey in Burgundy, France.